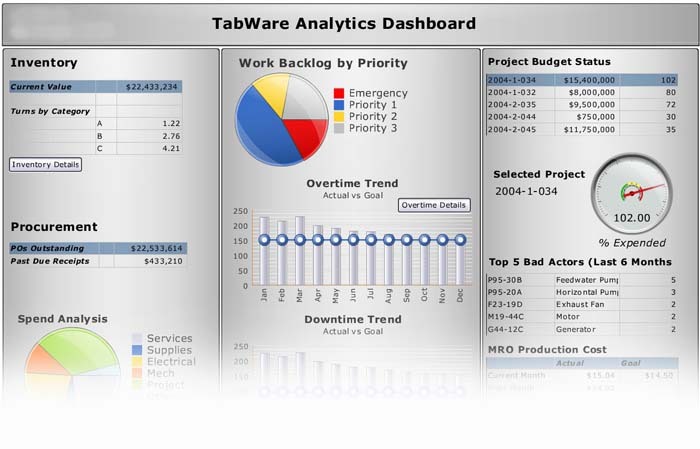 List of KPI’s and Matrics for Tabware Analytics Dashboard. for the Downtime Trend is very confusing to derive any results whats that looking like kind of Graphic Equilizer ? why would any one put the refrence line represented with Button like ,when it could be made simple with just one dotted or solid line instead of round buttons . Work backlog By Priority would be more meaningful if the pie chart also would had shown the % of the pie,why would any user do his eye-exercise to simply get the results of the report ?